With the advent of the interstate highway system, many Americans forgot about the beauty of rolling through small towns connected by old state highway systems. Michigan has approximately 57,000 square miles of land, but many Michiganders miss out on vast expanses of beautiful land while hurrying along I-69, I-75, I-94, and I-96. 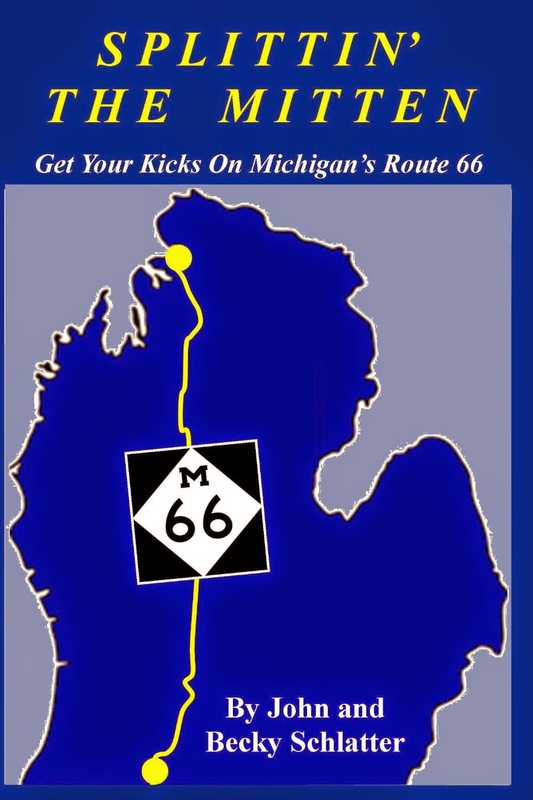 Splittin' The Mitten: Get Your Kicks On Michigan's Route 66 takes its readers back to a time before the interstate highway system. The book's authors, John and Becky Schlatter, focus on Michigan's state highway M-66, a road running north-south from the Indiana border to Lake Michigan, literally splitting the Lower Peninsula, aka the Mitten, in half. The Schlatters write in a conversational tone, and the book feels more like a travel memoir than a guidebook as a result. They highlight each town and major landmark along the 273 miles of M-66. With a population of 52,000, Battle Creek is the largest city along the journey. The rest of the towns along M-66 are much smaller, but they all seem to have the same two things: at least one ice cream shop and an old bank building at the town's main intersection. The Schlatters delve into the history of the locales along their drive. They describe roadside war memorials, general stores, and advertising signs painted on the sides of brick buildings that still remain as monuments to generations past. The book details legends and facts about many of the towns' histories, including the origins of some of the towns' colorful nicknames, like the Electric City and the Magic Capital of the World. Although the small towns along the path may once have been booming, they are slower now, but not dead. The book describes restored homes, theaters, and storefronts. These towns are not overrun with big box stores or major fast food chains, so they have retained much of their early 20th century charm. A travel book would not be complete without photos, and Splittin' The Mitten gives its readers photos of many of the landmarks described. Outside of the towns, the Schlatters describe the farmhouses that dot the land in the lower half of the Lower Peninsula. On the drive along M-66, the farms eventually give way to woodland and then the rolling hills and lakes of the northern Lower Peninsula. The book's journey ends at the northern terminus of M-66 in Charlevoix on the shores of Lake Michigan, but I found myself wanting the Schlatters to continue driving north across Mackinac Bridge so I could learn about the small towns and scenic routes of the Upper Peninsula. In the end, Splittin' The Mitten is a reminder to slow down and to look around at everything Michigan has to offer. Yes, the state has its famous cities, university towns, and vacation spots on picturesque lakes, but Michigan also has a heartland that is worth visiting. Splittin' The Mitten is currently available in both paperback and Kindle format at Amazon.com here.